Leslie Koch joined Methfessel & Werbel in May 2006. She came to the firm with experience in insurance defense litigation with a concentration in municipal entity liability in LAD, wrongful death and §1983 cases. Ms. Koch has made appearances representing clients in New Jersey, New York and the federal courts. 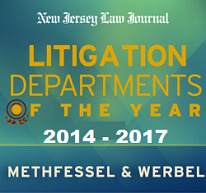 Prior to starting her litigation career, Ms. Koch was the judicial law clerk for the Honorable Katherine R. Dupuis, J.S.C., Union County, New Jersey. Additionally, she clerked for the State Attorney General’s Office in Newark and interned for The Honorable Joseph A. Falcone, A.J.S.C., Essex County and the Federal Public Defenders’ Office in Newark, New Jersey. In addition, Ms. Koch has 12 years of experience working for Merck & Co., Inc. in Rahway, New Jersey. She spent 4 years working in Merck’s licensing department, where she negotiated research collaborations with universities. Earlier she worked for 8 years as a research chemist, holding two U.S. Patents and co-authoring a number of papers published in scientific journals.